If your family is planning a vacation to Las Vegas you may be trying to decide between staying in a regular hotel room or a suite. A suite offers your family more room and usually separate sleeping and living areas. Suites also give you the luxury of eating at a dining table and perhaps being able to prepare snacks and meals in your room. This can save you money and time. 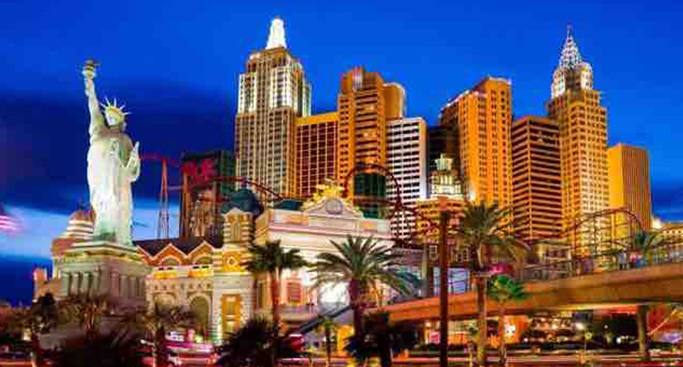 Las Vegas also offers suites that may be a short distance from the Las Vegas Strip but offer accommodations and prices available at weekly rates. Whichever location you choose for your family, suites can be the perfect choice to provide your family a home-away-from home while enjoying all the sights, shows and entertainment that exciting Las Vegas has to offer. Vdara hotel offers full-size kitchens in their suites. At 811 square feet these upgraded suites feature a bedroom, spa-like bathroom, a separate living room, full-sized kitchens with cook tops, microwave, full-size fridge and full-size washer and dryer. After arriving, you might never want to leave. The New York New York Hotel and Casino suites are approximately 900 square feet (that's compared to the city average of 350 square feet) of fabulous amenities such as in-room wet bar with refrigerator and coffee maker. Your family will enjoy the suite's multiple TVs with in-room movies, high speed Internet, and cordless telephone in each unit. There are many family activities to enjoy at New York New York like the Big Apple Roller Coaster and the large arcade filled with fun and exciting games. HGV Suites at the Flamingo offer 831 square feet, one bedroom suites with a king size bed and queen size sofa sleeper. Each unit comes with a fully equipped kitchen and a washer and dryer. There are separate living and dining areas. Complimentary Internet access and daily housekeeping are included. The children will enjoy their own swimming pool located within the resort's immense pool complex The resort also provides kids with their own pool table and game area. This non-gaming, non-smoking hotel is located next to Circus-Circus hotel, home of Adventuredome, the country's largest indoor theme park. It's a family refuge in the bustling 24-hour city, with the all the comforts of home: highchairs, playpens, laundry facilities, in-room coffee makers and toasters, an outdoor heated pool with poolside BBQs and more. The Orleans offers several sizes of suites for your family to enjoy starting at approximately 1,000 square feet with prices starting at $179 per night. Each unit comes with a king bed or two queen beds from which to choose. There are in-room hairdryers, iron/ironing board and wet bar with refrigerator. The Orleans offers a number of family activities including a bowling alley, movie theater, arcade along with Kid's Tyme, an entertainment center where the kids are supervised while the parents enjoy the adult entertainment offered. The Rio Hotel and Casino is located just off the Strip and offers Carnival-themed suites. Each comes with a sitting area and your choice of one king or two queen beds. Wireless Internet, LCD TV with cable and pay movies, fridge and phone are included amenities in each suite. You can choose to upgrade to suites that will also provide 1 1/2 baths, whirlpool tub and a separate dining area. The Rio also allows pets to say up to 50 pounds. The hotel has 60,000 square feet of shopping in their Masquerade Village which includes an art gallery and several novelty shops. Your family can enjoy swimming in one the four pools with waterfalls and a sandbar for the kids to play. All the activities available on the Las Vegas Strip are just a short taxi ride away or your family can enjoy the family fun offered at the Springs Preserve just moments away. The Rio Hotel and Casino is located at 3700 W. Flamingo Road, Las Vegas, NV 89103. The Comfort Inn provides suites featuring kitchenettes complete with microwaves, stoves, refrigerators, dishes and silverware. There is also an in-room coffee maker, hair dryer and iron/ironing board. The rooms come equipped with cable/satellite TV and phone with voice mail service. Your family can enjoy the on-site fitness center and the pool area with lagoon and waterfalls. There are also on-site laundry facilities. The Comfort Inn provides their guests with free hot waffles every morning with a new newspaper. This property is located less than one mile from the Las Vegas Strip and provides free shuttle service to the airport and the convention center. The address of the Comfort Inn is 4350 Paradise Road, Las Vegas, NV 89169. Please note that there are 3 other Comfort Inns in Las Vegas for you to choose with this location being the closest to the Las Vegas Strip. The Holiday Royale Suites are just one of many properties offering suites at weekly rates. All suites are completely furnished with bed, sofa, dinette set and include TV, telephone and Internet service. This fully gated site comes with a complete kitchen with all appliances and on-site laundry facility. Although not located on the Las Vegas Strip, it is right next door to the Hard Rock Hotel and Casino and just blocks from the Strip. This property's central location affords your family close proximity to City Center Complex, the Bellagio Hotel and Casino and is within walking distance to many family activities. The Holiday Royale Suites are located at 4505 Paradise Road, Las Vegas, NV 89169. Budget Suites of America have many locations near the Las Vegas Strip and throughout the entire valley. Their suites are a hybrid between a hotel room and an apartment coming completely furnished. Each suite has full sized kitchens and full size appliances. Additional amenities include free cable TV, high speed Internet, free local phone calls and on-site laundry facilities. Budget Suites of America locations provide guests with beautiful pool areas and complimentary coffee. Whether you choose to stay near the Las Vegas Strip or away from the glitz and neon, Budget Suites of America has a location ideal for your family. Please visit their website at www.budgetsuites.com for a complete list of locations or call 1-866-877-200 for additional information. Cancun Resort in Las Vegas is a resort with a contemporary Mayan design offering both one and two bedroom units. Each unit comes with fully equipped kitchens, bathrooms with jetted tubs, and separate living and dining areas. The resort also offers an on-site restaurant. Families will enjoy the resort's waterfall and five whirlpool spas. There are four large waterslides, a huge lagoon and a smaller pool for children. This family resort has a wonderful children’s' activity program to keep the kids entertained during your stay. Cancun Resort is located just 3 miles south of the Las Vegas Strip and close to the Southpoint Hotel which offers a movie theater and bowling alley. 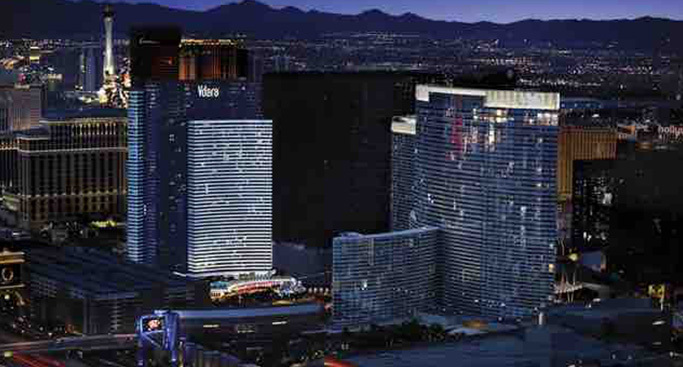 The resort's address is 8335 Las Vegas Blvd South, Las Vegas, NV. The Polo Towers offers one and two bedroom accommodations with your choice of a suite or a villa. Each unit has a living room area featuring a remote control television, DVD/CD combo and complete audio systems. There are full kitchens and separate sleeping areas. You will have plenty of room to relax and take in the amazing views of the city from your private balcony. The resort offers a state-of-art fitness center, roof-top pool and spa. Kids can enjoy the on-site water park and separate play area. The resort's location is within all the family activates available on the Las Vegas Strip and the surrounding area including museums, arcades, thrill rides and many free outdoor performances. The Polo Towers is located at 3770 Las Vegas Blvd South, Las Vegas, NV and can be reached at 1-888-663-3175. The Carriage House Las Vegas offers fully equipped kitchen/kitchenettes and spacious one and two bedroom suites. They have Internet access in each room, complimentary in-room safes, DVD/CD players and pay-per-view movies and games. The children will enjoy their heated pool and whirlpool along with the on-site basketball and tennis courts. BBQs and a complete fitness center are also available. The Carriage House Las Vegas is ideal for a short trip for the entire family to enjoy the Fountains at Bellagio and the thrill of seeing Mirage Volcano erupting nightly. 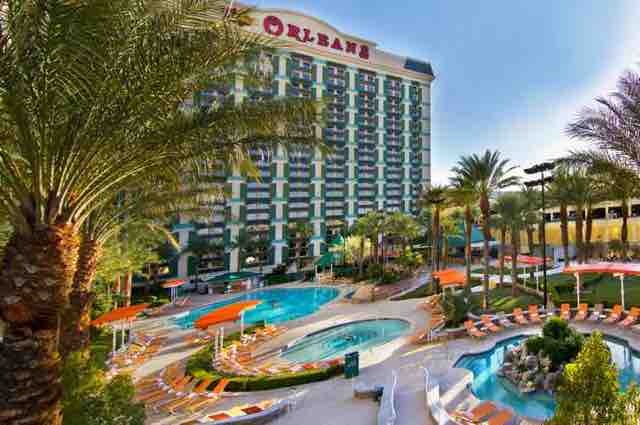 This resort is located at 105 E. Harmon, Las Vegas, NV with additional information available by calling 702-798-1020. The Tahiti Village offers a tropical paradise featuring spacious floor plans with fully equipped kitchens and kitchenettes. Their suites are perfect for large families with each suite featuring televisions with DVD/CD players, steam showers and jetted tubs. This resort also has an on-site restaurant and a full service spa. The kids will have plenty to do floating down the resort's lazy river and building sand castles on the beach style pool area. There are volleyball courts and a free-form pool. The Tahiti Village is rumored to have the friendliest lifeguards who are experienced with dealing with lots of kids. This property is located close to the Premium Outlet Shopping Mall and just a short distance to the Las Vegas Strip. The Tahiti Village's address is 7200 Las Vegas Blvd South, Las Vegas, NV and their phone number is 702-440-6800. The Grandview at Las Vegas offers luxurious villas with one and two bedroom units available. Each unit includes full kitchens with microwave and laundry facilities with full size washers and dryers. Guests can enjoy indoor activities such as television with DVD/CD players and games. The property provides guests with breathtaking views and beautiful pool areas including hot tubs. There are tennis courts on-site and exercise facilities. The children can enjoy their very own pool, playground and fully stocked game room. This location provides of traveling short distances to the many family activities such as The Springs Preserve and the Ethel M Chocolate Factory Tour. The Grandview at Las Vegas is located at 9940 Las Vegas Blvd South, Las Vegas, NV. The phone number to call for more information is 702-966-4700.